Marriage is about building a family together, but before that, it is about joining two families as one. Madeline and Zack knew this, and knew that their relationship would grow even more with their families’ support. Zack’s brother said he thought that their family would scare off Madeline, but instead she fit right in. From the start, she bonded with Zack’s brother and quickly became part of the family. On the other side, Madeline’s protective sister quickly saw how much Zack cared for Madeline, and gave her approval as well. After much family bonding, Madeline and Zack tied the knot at St. Thomas of Villanova Parish. After a traditional ceremony, everyone relocated to The Inn at Villanova for the reception. As the two entered the reception, Zack excitedly motioned to Madeline, showing off his wife. After their entrance, the couple joined together in a fun choreographed first dance. 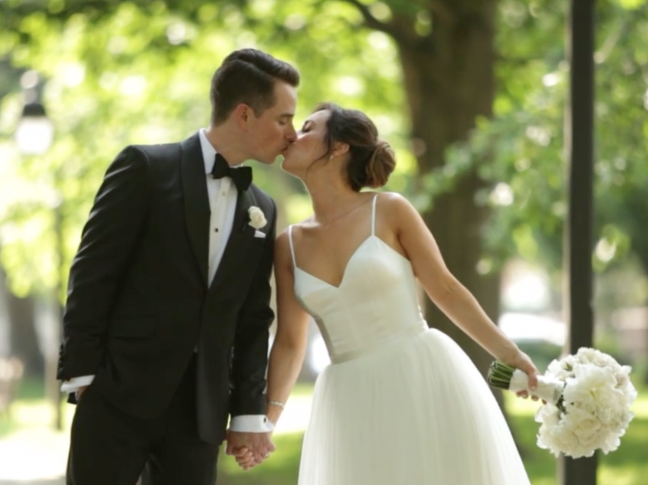 Madeline and Zack found happiness in each other, and their celebration showcased the love they created. Our Allure Films team was honored to film this joy for them so that they can relive it year after year. We were also joined by our talented friends from Morby Photography on this special day. BVTLive’s Jellyroll band set the tone for the reception with their entertaining performance as well. Congratulations Madeline and Zack! We wish you joy in every day together. Lindsay and Brian’s wedding party traveled in and out of Philadelphia for the big day. Starting out at the gorgeous Hotel Monaco, the bridal party prepared for the ceremony. After dressing up and applying finishing touches, they traveled to St. Thomas of Villanova. A large party of family and friends came to celebrate the beautiful and elegant wedding day. Guests dabbed at happy tears as they watched their friends exchange vows. When the priest finally announced them as husband and wife, the church roared with excitement. 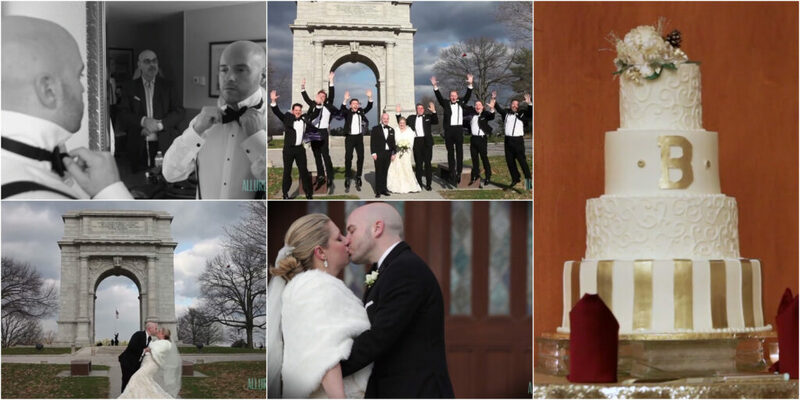 Our team at Allure Films followed the wedding party and guests all over the city that day. We road the trolley with the wedding party to the reception at Cescaphe Event Group’s luxurious Downtown Club. The unique reception venue shows beautiful views of Philadelphia from the windows. Guests can gaze out at historic Independence Hall from the venue, only seventy five feet away. EBE Talent performed at the reception and kept guests singing and celebrating out on the dance floor. Throughout the night, we were lucky to film numerous touching speeches from the newlyweds’ family members. Their kind words showed how excited everyone is that their favorite couple finally got married. Congratulations Lindsay and Brian! We wish you a lifetime of joyful memories. Not even the chilly weather could stop Erica and Daniel from shining on their big day! Allure Films was truly honored to film this happy couple’s special day. With careers as a wedding planner and a DJ, we knew that Erica and Daniel had seen more than their fair share of wedding videographers. The fact that they chose us truly speaks to our reputation, and we take it as a huge compliment! The pair tied the knot at St. Thomas of Villanova before making their way to the Crowne Plaza in King of Prussia. As we journeyed from the ceremony to the reception venue, we couldn’t pass up the opportunity to stop by the historic landmarks that lined our path! 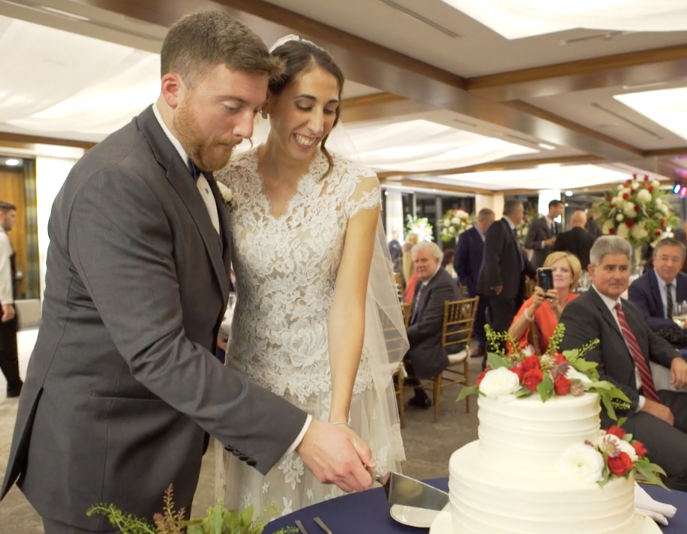 Not only did the stunning structures make for some fantastic photo ops for Frank Barbera Photography to capture, but they were the perfect backdrop for filming some of the best memories with the wedding party. It was clear through their smiles and loving interactions how much these two mean to each other. From the wedding day prep among family and friends, to the “I Do’s”, Erica and Daniel were full of excitement all day long. Enjoy a preview from their big day below! Contact Allure Films today and speak with us about a wedding videography package for your big day.